We lift the hood on our digital specialisms in a new TED Talk style series: The Future Of. Regardless of whether you’re part of a well-oiled in-house marketing team, or flying the flag agency-side, we all have a tendency to get blinkered by the day-to-day marketing grind. Tell me about a time where there haven’t been campaigns to optimise, media plans to prepare, budgets to reconcile and tactical emails or social campaigns to schedule, and I’ll tell you about the time Peppa Pig flew with the seagulls over Brighton Pier. Yet we all know that there’s danger in only being focused on the right now. Namely, that the future (or innovation), that very one that seems so far away one moment, will soon come creeping up to knock you off your marketing pedestal. And more worryingly, that future will most definitely be in the form of your competitors. Future thinking means smarter campaigns, new technology, more efficient processes, and bigger and better ideas. So, each month, we’ll be looking at exactly that. Kicking off with…. Brand. “Times, they are a changin’”. (sang Bob Dylan, the only man in history to win an Oscar and a Nobel prize). In 2011, the American Marketing Association defined a brand as “a name, term, design, symbol, or other feature that distinguishes an organization or product from its rivals in the eyes of the customer.” But in the last fifteen years, or perhaps longer, the way digital marketers have had to look at brands has radically changed. In fact, much like in accountancy, the idea of a brand being a tangible asset to marketers is becoming less and less the case. When we opened the question ‘What is a brand?’ out to the addmustard team, they responded with everything from: ‘a story to a ‘feeling’, ‘a lower CPA’, and ‘a higher propensity to convert’ and of course ‘more loyal customers and repeat purchasers’. There are all sorts of transformations going on in the world of brand building. But probably the biggest and most influential is the relentless development of digital technology and media. Twenty years ago, marketeers had to worry about little more than ads, PR, packaging, mail drops and brochures. Now we need to build brands using social media, search, digital outdoor media, online display networks, retargeting, website, apps, aggregator sites, email, electronic messaging, vouchers, and a million types of content formats. Data is the new marketing currency. Trust takes years to build, minutes to destroy. Consistency across channels is essential to building value in the brand. Prospects & customers are defined by attitude and motivation, not solely by age and income. Brands are subjective, but everyone knows a great one when they see one. The complexity of digital media is driving these changes. To counter this complexity, we advise simplicity. 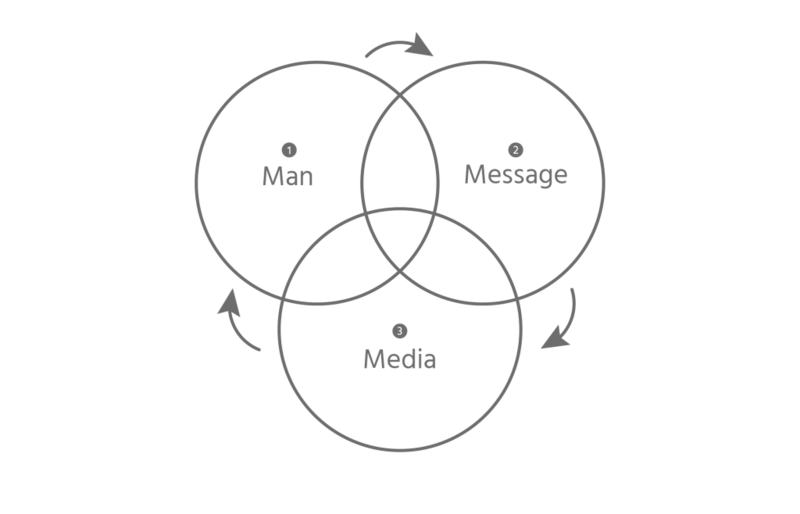 Brand owners need to take time to crisply define their customers and prospects (man) in terms of attitudes & motivations; to sum up the brand meaning (message) into a single, unique brand thought, and to create a long-term plan (media) which encompasses all marketing channels and customer touchpoints. We advocate talking to customers, objectively and independently, mining data about them to find the “nuggets” of information which will help to understand your loyal followers, or advocates; your recent converts and your long-term prospects. Understanding the motivations (why they interact with your brand) of these different groups will help you to define a consistent message and the creative focus of your brand. We start with a single, simple brand thought. Like Monzo’s “a bank for everyone”. Or Xero’s “love doing beautiful business”. Or easyJet’s “Generation easyJet”. It doesn’t have to be a strapline, but it does have to run through everything you do: written, verbal, and creative communication. On social media, on your website, your app, email. And, of course, your advertising. And you must do it consistently. Once you know your loyal followers, recent converts and long-term growth prospects, you then need to plan your media (including all of your digital assets) to deliver your message and creative consistently. We recommend continuous testing on search and social media channels, to refine message variations, measuring interaction factors, conversion and retention. As the message and creative becomes refined, it can then be rolled out into your always on and peak and promotional campaigns. And finally, it is imperative to continuously measure the performance of your brand: share of impressions, share of brand and direct traffic; interaction of your loyal followers, recent converts and long-term growth prospects with your brand. We live in a world where brand measurement tools and the availability of data provides us with a goldmine of information that we can use to continually test and refine our brands until we really create a great one. So, in this increasingly complex, dynamic word in which digital plays such an important role, it’s imperative to understand the motivations and attitudes of your customers; simplify your brand message, and apply it consistently across all of your media channels and assets. but you can start where you are and change the ending”.